Did you think we had run out of novel ways to use panel extenders and desktop dividers? Not even close! 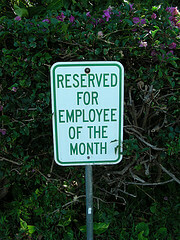 Every good manager knows that rewards and recognition go a long way toward keeping employee satisfaction levels high. With a custom-printed “Employee of the Month” panel extender, you can let everyone in the office know who has done an outstanding job over the past 30 days. Along with the text, you could choose to add graphics like party balloons and confetti. Then, have a cake or other tasty gift delivered to the employee’s cubicle for everyone to share. Since our products are easy to install and remove, you can simply transfer the “Employee of the Month” panel to a new workstation as needed.